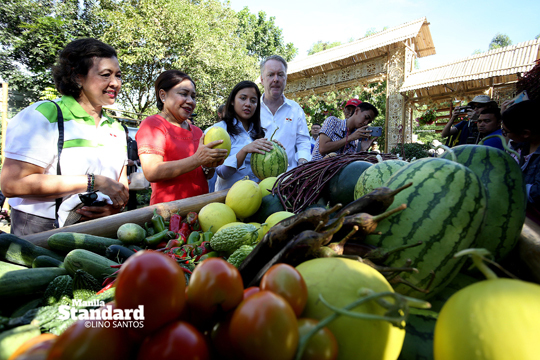 Senator Cynthia A. Villar and daughter Camille Villar lead the delegates of the 25th ASEAN Seed Congress to a tour at the ‘vegetable and flower gardens’ at the Villar SIPAG Farm School in Bacoor, Cavite. Eighty foreign delegates from 49 countries saw the ‘quality products—the flowers in bloom and the healthy vegetables as results of using quality seeds. Below, a ribbon-cutting ceremony to usher the ‘Field Day’ opening shows led by Senator Villar, along with (from left), Henk Hermans, East-West Seed general manager; Camille Villar; Dra. Mary Ann Sayoc, East-West Seed Public Affairs lead convenor and Michelle Devaerrewaere, East-West Seed VP. East West Seed is one of the top seed companies in the world which has been helping the senator in her advocacy in pushing for reforms to spur agricultural growth and alleviate the plight of farmers.